'Tis the holidays and New Years translated to English means 'heaps of friends and family crashing for the night all over your floor in various states of sobriety'. 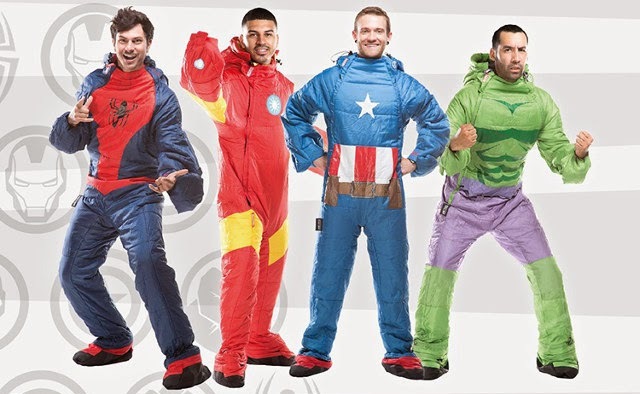 So imagine spending New Years on said floor in your very own wearable Avenger sleeping bag by Selk'bag! So long onesie! Sure there may be no She-Hulk or Scarlet Witch variant for the ladies (or an Ant-Man and Wasp option for the kiddies), but look - Spidey and Cap have boots! In all honesty, if I had the Captain America number there, I probably would never take it off. I mean with legs, arms and 24/7 comfort, why would you? It's definitely cooler than just tumbling onto a random piece of furniture. However, it does have the downside of needing a certain level of sobriety to be able to navigate the arms and legs. It'd be perfect if all you had to do was nod your head, wiggle your nose, or rub a lamp.